Last week, while the northeast hunkered down under the polar vortex, I made my annual escape to Miami to spectate at the Hempel Sailing World Cup (bookended by two Snipe regattas). Though Coconut Grove and its signature January regatta have changed dramatically in the decade since I participated, performance on Biscayne Bay (nicknamed “the playpen,” for its protected waters and benign temperatures) remains a critical gauge of progress in any Olympic campaign. This is the only time each year when the five-ring circus of international sailing comes to us. Each year of the quad has a different vibe, and year three is always the biggest, pushing up against quotas set by World Sailing that restrict maximum numbers in each class. 2019 had 650 athletes from 60 nations competing, because countries with enough depth and funding sent several teams in each discipline. By next January, most of those international squads will have been winnowed down to focus on their top one or two Tokyo 2020 candidates—a pecking order that might be affected by the results posted this year in Miami. For the US Sailing Team (USST), this regatta determined which sailors would go to this summer’s Pan American Games in Peru. 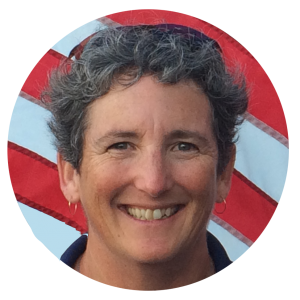 It was also a qualifier for the 2019 USST, which helps sailors with coaching, funding, and logistics—as well as that most elusive positive of all, national pride. The rich, as they say, get richer, and in this critical home stretch—the last eighteen months, when everybody is training full-time—the more attention and support and international experience an athlete can gain, the better. 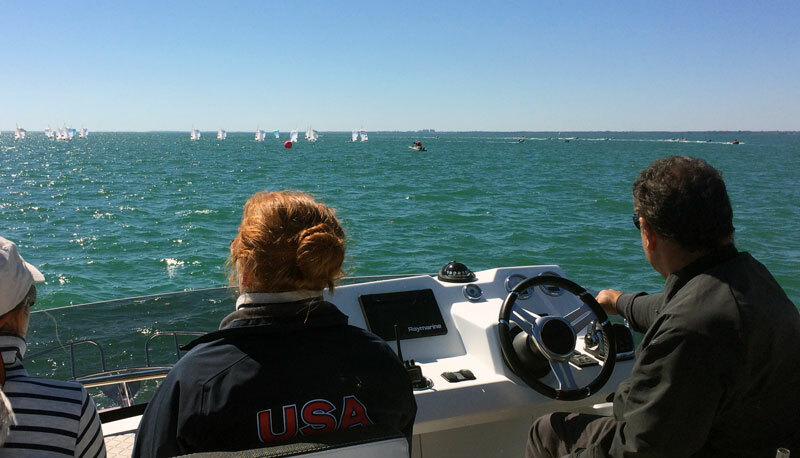 It’s easy to see the big picture from the VIP boat at Miami’s Sailing World Cup regatta. What you can’t see are the important details. Everyone sailed out of Regatta Park except the boards, which launched from the Coconut Grove Sailing Club only a block away. Many boats rigged up within sight of the sidewalk, like an Olympic petting zoo; teams arrived, did boat work, stretched hamstrings, and chatted with their coach and competitors. The only accessory needed to observe campaigners frolicking in their boat-park habitat was a pair of comfortable flip-flops. What such a casual sidewalk scan could not reveal is the depth and focus underlying such seemingly trivial actions. More than halfway through the quad, every sailor’s boatpark time has been carefully honed into a personalized and mindful list of priorities. Posting solid results on Biscayne Bay (especially in the challenging conditions of 2019) comes, in large part, from avoiding mistakes; in the pressure cooker of a big regatta, only experience can teach what’s most important at any particular time. On or off the water, it’s important to focus on what will bring the biggest improvement for the least amount of time invested—even if that means the mind-numbing distraction of replacing a worn line, ignoring the casual spectators gawking from the sidewalk. Luther Carpenter, the coach who’s helped win 5 US Olympic medals so far, estimates that sailors have to make 600 decisions over a forty minute race. Add in physical training, and it’s easy to see how gaining Olympic experience becomes a full-time endeavor. 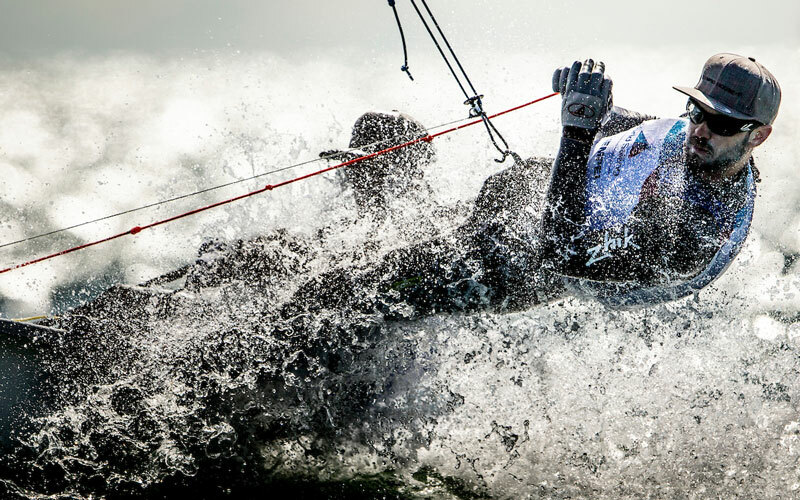 What’s harder to understand is why the sailing is the easy part. Once those athletes push away from the ramp to sail or tow out through the Dinner Key channel, their goal until they return to shore a few hours later is very clear: perform on the race course. It’s much harder to maintain longer term focus, because each team only knows in hindsight what helped them navigate through the sea of shoreside distractions, managing the conflicting demands of time, energy, and—of course—funding. For me, both watching the racing and wandering through Regatta Park was a smorgasbord of inspiration, nostalgia, and gratitude. Inspiration, from watching the next generation of Olympians working so hard in pursuit of a shared dream. Nostalgia, because there’s nothing so purifying as that selfish, singleminded pursuit of excellence. And gratitude: that back in 2004, it was still possible to go to the Olympics as a 40 year old part-time sailor. Since 2004 the US has struggled on the world stage, even in our home waters of Biscayne Bay. We’re still behind, but for the first time in several years I’m excited by the USST’s aligned solidity under the leadership of Malcolm Page and Greg Fisher. A lot of behind-the-scenes work has established a platform of experience and confidence that will support future excellence. 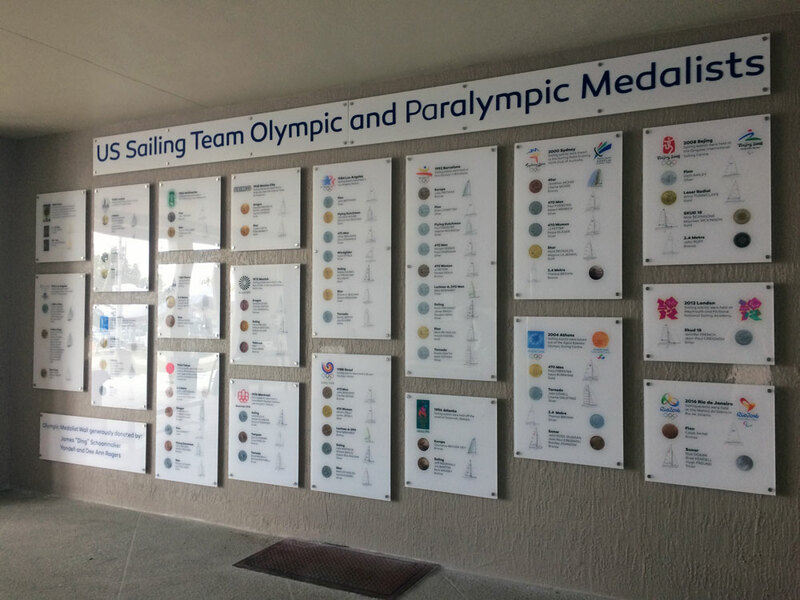 At the same time, some very visible changes have been made; the best example is the medals wall recently added to the US Sailing Center. There are far too many variables to quantify how much pride in our Olympic heritage improves future results, but when every US athlete has to walk past a wall filled with 119 years of medal-winning legacy to visit the team locker room, that can’t help but make Olympic goals more tangible. 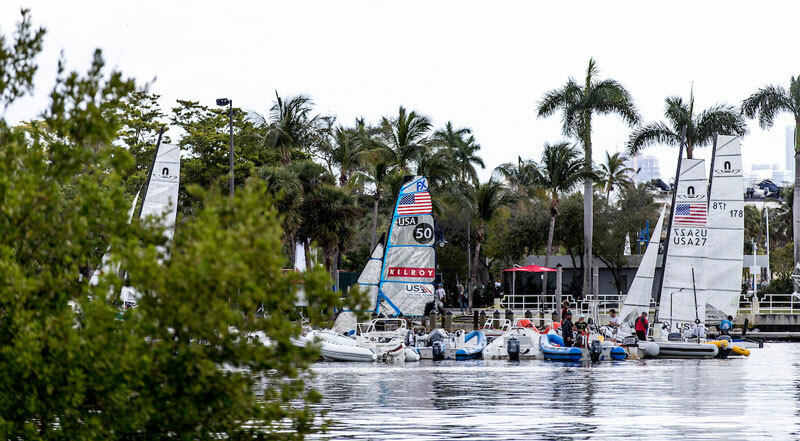 Two US teams won medals at Sailing World Cup Miami 2019. We’ll have to wait another eighteen months to know if all the hard work by athletes, staff, and supporters translates to a similar haul at Tokyo 2020. But the most important work is already complete; building a platform of excellence on which future US sailors can stand with confidence, knowing they’re part of a world-class team.